Posted on 9/19/2014, 8:04 am, by rackycoo, under General Projects. 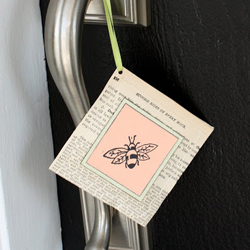 This weekend, I’m featuring these adorable bee-themed wild flower seed packets in honor of National Honey month. Simply stitch wild flower seeds into paper pockets and decorate! LimeRiot made hers to hang on her neighbor’s doorknobs in celebration of spring. She included a full tutorial with her post so you can make your own. Happy Honey month! Choosing cards is good because we can write blessings personally on cards which is really great idea; but I think cute dolls are also nice choice, compact and not so expensive. I love this. A great gift idea. So adorable! These would make amazing practical gift tags! These are great! I need to remember this next spring. This is such a lovely gift idea!